The day we did our NIMH testing, I’d just completed a rather grueling (if somewhat low-key) week: four evening rehearsals, four early morning writing sessions, three runs, and three afternoon fireside chats, each one with a different friend (one being my mama). So that day, a Friday, I declared the morning off. I slept in, helped the kids with their studies, and supervised chores. Mid-morning, I decided to bake a cake — specifically Samin’s Almond Cardamom Tea Cake from her fabulous, fabulous, FABULOUS book Salt, Fat, Acid (and if you haven't yet seen her Netflix show, get on it!). I love cardamom, and I had an overload of almond paste squirreled away in the freezer, and besides, I’d been thinking about that cake for weeks. Maybe even months. I had to race the clock to get the cake done — we were supposed to be over at my parents' place at noon — so it was still warm when I flipped it onto a glass stand and dusted it with a flurry of powdered sugar. 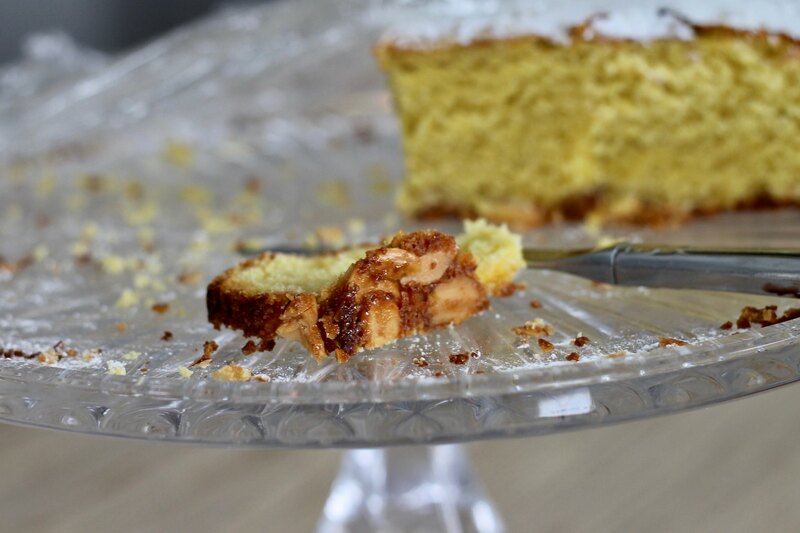 My son chauffeured me over the snowy hills to their house, the cake stand balanced on my knees, the rich scent of buttery almond filling the car. 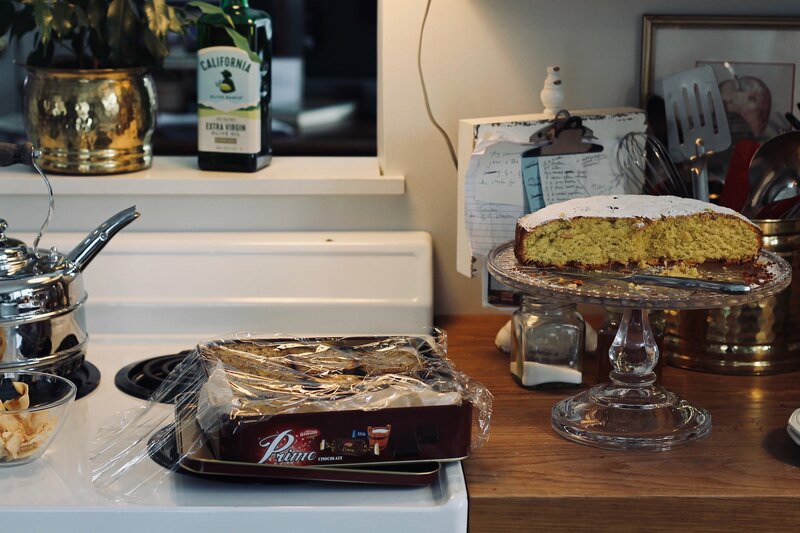 At their house, I plunked the cake on the counter — Mom had set out a tin of banana bread, too — and off and on that afternoon, while drifting from one test to another, we snacked on cake. When I asked my mother what she thought of the new recipe, she announced, "The almond flavor is too strong." "It's just almond!" I said. "Real almond!" "Oh," she paused. "I guess I just don't much like almond." I thought the cake tasted exactly as it should — like almond!!! — and everyone else seemed to like it well enough. The research director even went out of his way to compliment it. Back home, we (mostly me) polished off the last few pieces over the next several days. As with other rich butter cakes, the flavor seemed to deepen and mellow with time, making this an excellent do-ahead cake. Adapted from Salt, Fat, Acid, Heat by Samin Nosrat. Even though there are two and a half teaspoons of cardamom in the cake, the flavor is surprisingly mild. Feel free to add more, if you like. In a small saucepan, cook the butter and sugar for a couple minutes, until the sugar has dissolved and the liquid bubbles. Remove from heat and stir in the almonds and salt. Pour the sauce over the bottom of a greased, parchment-lined 10-inch springform pan. Set aside. In a small bowl, stir together the eggs, cardamom and vanilla. In another small bowl, lightly stir together the flour, baking powder, and salt. Roughly chop the almond paste, put it in a food processor and pulse until sandy. Add the sugar and pulse until blended. Add the butter and pulse until smooth and fluffy — a couple minutes. With the processor still running, add the egg mixture slowly, a spoonful at a time, stopping every now and then to scrape down the sides. Transfer the almond mixture to a large bowl and add the flour mixture, gently folding it in in three additions. Do not overmix. Pour the cake batter into the prepared, almond-sugar crusted pan. Bake the cake at 350 degrees for 50-60 minutes. Let the cake cool for 10 minutes before running a knife around the edge and then inverting onto a plate. 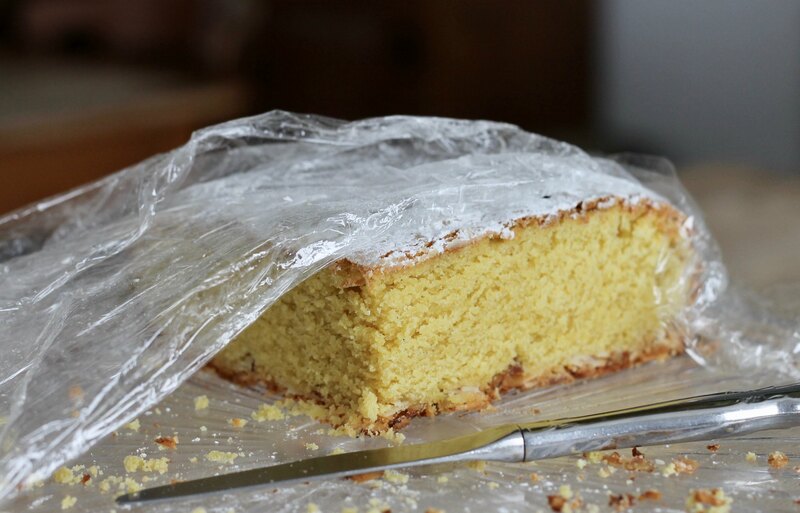 Remove the parchment paper and then invert onto a cake stand so that the almond crust is now on the bottom. Dust the cake with powdered sugar, if desired, and serve either warm or at room temperature. This same time, years previous: spring hits, the solo, pop quiz: what did you eat for lunch?, all things Irish, a morning's start, warmth, roasted vegetables, cherry pie, oatmeal pancakes. I just might make this! I have a tube of almond paste somewhere, and I adore cardamom.